The term hacking has been around for a long time. I almost hesitate to use the word. But, until another word transcends it I will continue to use it. Nonetheless, as this text delves across and into different fields of creative thought and critical practices in art and hacking. I suspect we will get closer to fresh ways in thinking and enacting situations that will open up different beginnings of venturing beyond the word itself. This study investigates contemporary art and cultural activism in terms of Hack Value. It explores artworks, innovative projects and hacking tendencies with and without technology. It argues that hacking has been with us a long time before our use of computers. A characteristic all hackers share whether it is legal or illegal is to break into or through machined and walled up systems. Indeed, it could be argued that resistances, rebellions, uprisings and revolutions share similarities to hacking. They are all social and cultural hacks against, closed, dominant and reigning systems. By examining social and cultural hacks, technical and non-technical, and observing the similarities shared to overturn existing concepts and established modes of representation. [i] We can ensemble a set of processes not specific to technology alone, but towards a creative and ecological context that informs a flexible, contemporary and trans-disciplinary art practice. Hack Value can be a playful disruption. It is also maintenance for the imagination, a call for a sense of wonder beyond the tedium of living in a consumer, dominated culture. It examines crossovers between different fields and practices, in relation to their achievements and approaches in hacking rather than as specific genres. Like in other chapters some of the artworks and projects exist in their own right, and within and outside of a museum or gallery context. Other examples either play with or disrupt situations through cultural enactments of communication with others; these include publications, farming, food distribution and public heritage sites. All the projects and works studied are social. Some are political and some are participatory. This includes works that use digital networks and physical environments as well as printed matter. What binds these examples together is not only the adventures they initiate when experimenting with other ways of seeing, being and thinking. They also share common intentions to loosen the restrictions, distractions and interactions dominating the cultural interfaces, facades and structures in our everyday surroundings. This relates to our relationship with food, tourism, museums, galleries, our dealings with technology, belief systems and community ethics. By looking at the social settings, connections, intentions and the spirit of these hacks, we will get closer to what we can call Hack Value. It examines different instances of hacking that contest the general assumption that hacking is about technology alone. It asks what it means to transfer hacking skills and its connected values of free and open culture into physical environments, and investigates what this looks like. How would it change our perceptions and understanding of art and does it effect the relationship with the public experiencing this kind of art? What impact would it have on society and the systems dominating contemporary art culture? In The Curious world of Art and Hacktivism, I refer to Richard Stallman’s[ii] playful display of the term hacker at a lunch with GNU fans in Korea. [iii] Where instead of using two chopsticks he managed to use three in his right hand and successfully picked up a piece of food and placed it into in his mouth. This was demonstrated as Hack Value. [iv] Stallman’s hack with simple chopsticks illustrates to us that it is not always necessary to use technology to hack. At its core, it is about how we approach things. This study comprises of technological and physical forms of hacking. It also includes aspects and actions of: agency, skill, craft, disruption, self-education, social change, activism, aesthetics, re-contextualising, claiming or reclaiming territories, independence, emancipation, relearning, rediscovering, play, joy, being imaginative, criticalness, challenging borders, breaking into and opening up closed systems, changing a context or situation, highlighting an issue, finding ways around problems, changing defaults, and restructuring things. How can artists and artists’ groups maintain control over their own imaginative ideas, and fulfil their individual and collective intentions, whilst maintaining critical positions; within the context of a globalised culture where prevailing attitudes fashioned on austerity measures and the economic crisis are now part of our everyday lives? This study examines different approaches around and through these dominant, neoliberal structures with an attention to networks, and examples of ‘being and doing’ with art and hacking, alongside critical ideas involving activism. All the projects, artworks and instances featured possess particular qualities that are disruptive and subversive. The models, instances and actions included in this text are not to be judged as stylistic or only as political, but as critically motivated expressions demanding something better and deeper, where a connection with our everyday life consists of a heightened sense of humaneness, possessing grounded, social and philosophical sensibilities. It leans towards a radical form of emancipation. One cannot fully cover the range of diverse contributions by groups and movements that enrich and inform this writing, such as DADA, the Situationists and Tactical Media. However, it is necessary to include their influences accordingly. There is a presumption that everyone is connected to the Internet when in fact many are still not. This needs to be readdressed. Not by connecting even more people onto the Internet or kitting them out with new technologies. Sure, sharing technological resources to support indigenous and local infrastructure is a honourable ambition. However, teching up environments where it may not be necessary more reflects a western viewpoint. Where the binary of ‘having and not having’ is a prominent condition. Sharing tools with others who do not have them is potentially ethical, sensible and emancipatory. Yet, pushing our own technological templates onto indigenous people’s lives may not be in accordance to their own grounded social contexts, nuances, long histories, beliefs and local systems. In this sense, common people of the world share significant traits and dispositions where hegemony and imperial structures have positioned, top-down ideologies via bureaucratic and political economies, onto already richly formed communities. This commodification of life as Bookchin puts it, “is vitiated by the association of needs with consumption for the sake of consumption…”[xii] (Bookchin 1995) just because our societies value these technological breakthroughs does not mean it works for others. This study also draws upon earlier struggles going back to the 1700s in England when everyday people such as Gerrard Winstanley and others forged a movement known as the Diggers also known as the True Levellers, to reclaim and claim common land from the gentry for communities. All examples and contributions will be argued in the context of hacking, whether from the 1700s, recent history and the present day. If this were a larger study it would include the influential Florentine of the 1600s Niccolo Machiavelli. He believed humans were essentially selfish and his own political tactics and writings have influenced many politicians and even hackers, especially his theory of statecraft. However, this investigation is about the inclusion of those not heralded as officially accepted within a political, cultural hegemony and traditional, mainstream art canons. Some of the individuals and groups referenced may now be well known. But their ideas, work and activities speak in terms that relate beyond supporting hermetically sealed and dominating power systems. The aim is to introduce a discourse that pulls together innovative tactics and ideas where social and technical forms of disruption are not caught within oppositional conditions, and or situations of violence. On one hand this study considers the reasons for revolutionary actions, desires and related tendencies, on the other it advocates non-violent processes and outcomes by studying alternative possibilities as intuitive, technical and physical forms of contextual and cultural hacking. [i] Christopher Kelty. Two bits: The cultural significance of free software. Durham: Duke University Press. (2008) P. 94. (Referred to by Johan Söderberg. 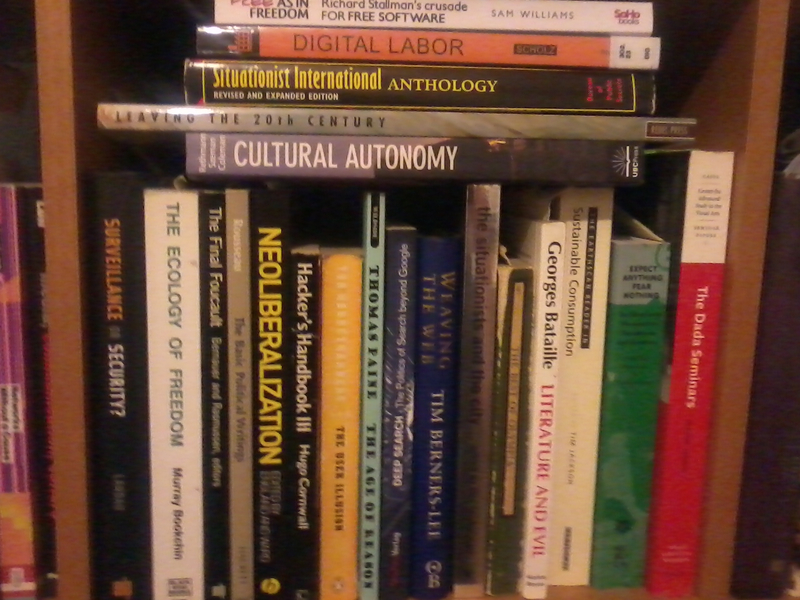 Free Software to Open Hardware: Critical Theory on the Frontiers of Hacking. [v] Guy Debord. Theses on Cultural Revolution. (1958-69) Situationist International Anthology. Revised and Expanded Edition. Edited and translated by Kenn Knabb. 2006. P.53. [vi] Leah A. Lievrouw. Alternative and Activist New Media. Digital Media and Society Series. Polity Press. 2011. P. 32. [vii] “Tactical Media are what happens when the cheap ‘do it yourself’ media, made possible by the revolution in consumer electronics and expanded forms of distribution (from public access cable to internet) are exploited by groups and individuals who feel aggrieved by or excluded from the wider culture.” David Garcia and Geert Lovink. From Alex Galloway’s book, Protocol: How Control Exists after Decentralization. From a chapter called Tactical Media. The MIT Press. 2004. P.175. [viii] Sadie Plant. The Most Radical gesture. The Situationist International in a Postmodern Age. Routledge. 1992. Preface Page 1. [ix] Alexander R. Galloway. Protocol: How Control Exists after Decentralization. The MIT Press. 2004. P.206. [x] Mary Flanagan. Critical Play: Radical game design. The MIT Press. 2009. Chapter 1. P.6. [xii] Murray Bookchin. The Ecology of Freedom: The emergence and Dissolution of Hierarchy. Black Rose Books. Reprinted 1995. P. 69. [xiii] The Castoriadis Reader. Chapter: Marxism and Revolutionary Theory (1964-65*): Excerpts. Marxism:A Provisional Assessment. The Historical Situation of Marxism and the Notion of Orthodoxy. Edited by David Ames Curtis. Blackwell Publishers Ltd 1997. P.169-70.